To start off with, I will let everyone know that I am not vegan. I am a vegetarian, but honestly, the only things that keeps me from being vegan is that I eat eggs. I read this book because I feel that when you start to take things out of your diet, like meat and dairy, you should learn more about what the alternatives are and how to get those nutrients from other sources. Since I am a vegetarian, I found the beginning of the book Becoming Vegan The Complete Guide To Adopting A Healthy Plant-Based Diet by Brenda Davis, R.D and Vesanto Melina, M.S., R.D. very interesting. It starts out with the history of veganism. I am such a food history buff! I thoroughly enjoyed the details of how veganism began and evolved into what it is today. The next part of the book goes into nutrients and what the body needs. The book goes into so much detail about what our bodies need and how to get it from unexpected plant sources. Most people ask me on a regular basis if I get enough protein because I don't eat meat. I actually plugged my information for a normal day into the mypyramid.gov website the other day and it said that I get way more protein than necessary and the only "true" protein I ate that day was pinto beans! Since I have cut dairy out of my diet, I am more concerned about getting the calcium I need. Becoming Vegan The Complete Guide To Adopting a Healthy Plant-Based Diet gives you all of the information you need for finding different food sources that will give you a calcium boost. The book even gives you menu options based on your calorie goals to stay healthy. There are a few quicky recipes within the text, but this is not a cookbook. This is a great resource for learning about different food sources that will give you the nutrients you need when you have to cut out different food groups! Our favorite...cinnamon bread! 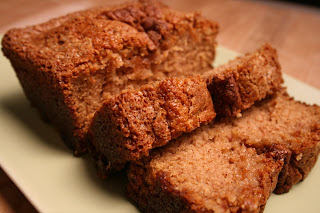 With vegan milk substitute and flax egg, this one is so good! 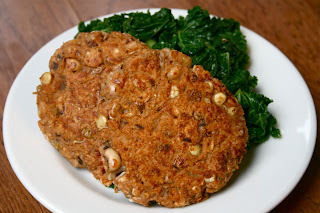 Black eyed pea burgers with sauteed garlic kale...yum! 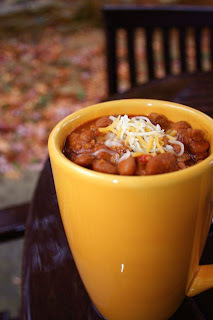 Our favorite chili...I am making this tonight! Oatmeal for breakfast and dessert! 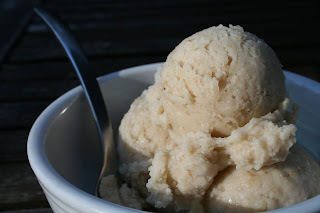 My own creation of oatmeal ice cream! Great review and photos! I read that book a while back. i am trying for few months to become a vegan ..but i cant afford it. lol.. this book is really on of the best and it makes me a good sheaf in my kitchen. Thank you for sharing your thoughts. I really appreciate your efforts and I am waiting for your next write ups thank you once again.In the event that you need to make a professional job resume, exploit professional job resume writing service. These resume services give you high caliber and capable resume 100% as indicated by your altered prerequisites. 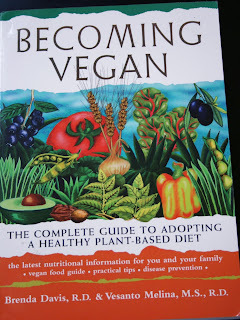 I am also looking for the book which can help to make going Vegan easy and going to start vegan diet soon which means that I consume no animal products whatever, including dairy products. And one of my colleague who is providing dissertation services along with me at Quality Dissertation suggested me the book as Becoming Vegan Book which includes information on how a vegan lifestyle guards against long-lasting disease and what the best sources for protein and calcium really are. Its really nice book, which we can follow perfect diet. Since I am writer at coursework help - http://www.eliteassignment.co.uk/coursework-writing-help/, I also follow this book because of the authors of this text explore the profits of a vegan diet, and eating without eggs or dairy foodstuffs. In accumulation they explain why more and more people are actuality motivated to become vegans and discuss the significances of their choice. Perfect book for vegan diet. The key to a nutritionally sound vegan diet is variety. A healthy and varied vegan diet includes fruits, vegetables, plenty of leafy greens, whole grain products, nuts, seeds, and legumes. I suggest this book to one of my students who looking for vegan diet and also take finance assignment help - http://www.secureassignmenthelp.com/finance-assignment-help/ from me at Secure Assignment Help. I hope this book will helpful to them and see what he say. Very informative post about Vegan Book. I would recommend to an omnivore considering a vegan or vegetarian diet. But this is an excellent book for one of my student who come to take help with personal statement from me and decide to eat vegan and needs practical advice on how to do so healthfully. It goes into exhaustive detail on every macro and micro nutrient the body needs. I appreciated that the book doesn't sugarcoat everything about vegan nutrition. It points out the areas that vegans need to pay special attention to and how to best address them. I found the chapters on "Vegan Athletes" and "Vegan Diplomacy" to be particularly valuable. This is a comprehensive book on every aspect of vegan nutrition. The authors are experts, and answer every question one might have about virtually all the nutrients that are considered to be important to health. Since I am professional CV writers at CV Folks. I don't think I could ever be completely vegan, I love cheese and ice cream! 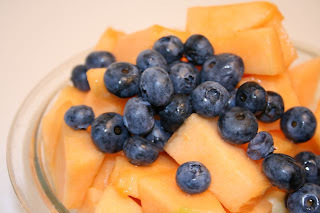 But it reminded me to eat more whole grains and fruits and veggies.